Great leaders think big. They take the seed of an idea and grow it into something larger than anyone else would have thought possible. In my previous post “Summarize, Generalize, Hypothesize – Thinking Big Part 1,” I wrote about a few techniques for identifying great ideas, and turning small ideas into big ones. In that article, I focused primarily on the nascent stages of idea development, of getting in the habit of mentally inducing something larger and more impactful. That part of the process is naturally a personal, internal one – with the ultimate goal of becoming so ingrained that it happens automatically within a few seconds of hearing or thinking of an idea. But great ideas are ones which also survive a vetting process where others who are likely to have valuable input, and who may also eventually be involved in implementing the idea, also contribute to the expansion and filtering of the details. Ideas are a dime-a-dozen, which leads to the intriguing implication that most ideas are worthless, and a precious few represent the nuggets we all search for. Because most ideas are free, they have a couple of interesting properties. First, people will share them freely, and second, ideas are (or should be) easy to throw away. These two properties naturally lead to the next two steps in ideation: Synthesize and Prioritize. The third step, Evangelize, helps bridge the process of ideation that began with “Summarize, Generalize, Hypothesize” with the rubber-hits-the-road reality of execution, while simultaneously building the momentum and passion necessary for success. This phase is all about getting others involved, a little at a time, to improve upon your core idea, flesh it out, or even help discover its true core. You will quickly find out if the idea is no good, because either people will tell you so directly, or no one will want to follow up on it. But if the idea is great, you’ll get all kinds of feedback, volunteers, and other support you’ll need to build a foundation for execution. It is easy to get caught up in the excitement of potentialities when synthesizing, and forget that, most of the time, ideas don’t pan out. That’s why prioritization should follow close on the heels of synthesis. When he talks about innovation, Astro Teller (the head of Google X) always emphasizes the importance of brutal prioritization of ideas (See for example this summary: Some thoughts on innovation from Astro Teller). Starting with the fundamental observation that the vast majority of ideas are bad (or at least not “big”), it follows that most ideas should be killed as quickly as possible. This should be done using the simplest reasons first – like “not physically possible” or “illegal or immoral.” Some ideas that are not immediately killable should be explored in a brainstorming or conceptual “white paper” mode (as described above). The few ideas that survive this should then be built into a prototype or “minimum viable product” (to use the language of Eric Ries’ “Lean Startup”), and then tested to see if they are actually good enough to iterate on and productionize. The point here is that you should assume your ideas are bad until you can prove them otherwise. Is the problem it solves big? Does it actually solve or significantly ameliorate the problem? 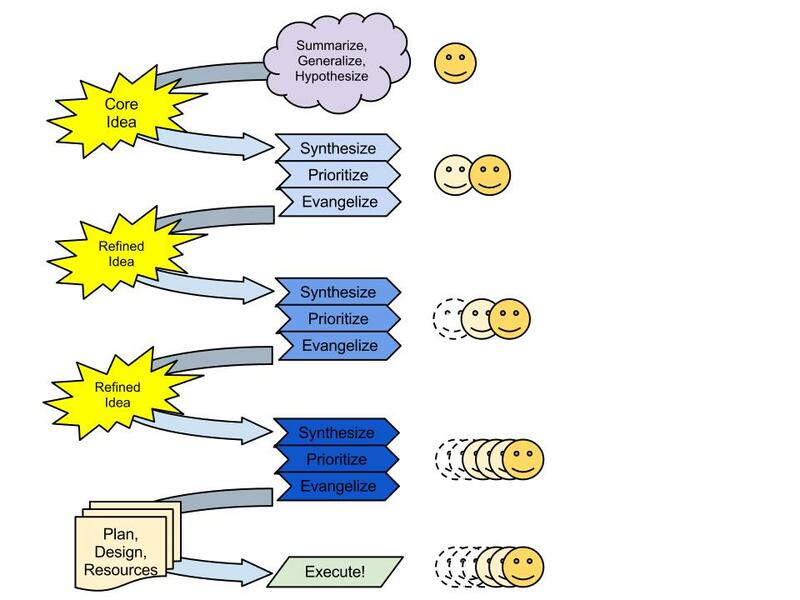 When first synthesizing, you’ll naturally be sharing your idea with a small group of people. But once the group has hardened the core of the idea and reduced it to its smallest coherent state, it’s time to expand that circle. Always look to be adding new members to your “idea-backing group” that are from a diverse set, but especially go out of your way to include potential customers and potential backers. Structure how you present the idea as a solicitation for help, not as an edict. And involve the current supporters in your solicitation for new members. As the number of people who know about the idea increases, some will naturally fall by the wayside, while others will hang on. It’s important to monitor two things about this process. First, the retention rate needs to be something significantly larger than zero. In other words, if the overall size of the group of supporters doesn’t grow with time, that’s a possible sign that the idea doesn’t have what it takes to fly. Second, the core supporters need to be identified and actively engaged, to keep the momentum building. Some feel that evangelizing is an art form, but there is a science to it that you can, and should learn. “Made to Stick” by Chip and Dan Heath provides an excellent framework around building up ways to make sure that others remember, understand, and even support and adopt your idea. It may take one round, or dozens, of this cycle to get to the point where you have the will, the vision, the design, and the resources to begin execution, but rest assured that if the idea is truly big and great, it will survive the process and be ready for full-scale implementation. Be careful, though – not everyone on the idea-backing team should also be on the implementation team. Make sure that any backer you carry over has the requisite skills, knowledge, passion, and/or position of authority to be able to contribute. Otherwise, as with the prioritization of ideas, you’ll need to ask them to step aside, even if only temporarily, until that point when they can contribute again. Great leaders think big. They can spot a great idea, develop it, and then make it happen. Some people have a natural talent for seeing the larger potential of great ideas, of knowing which sparks are capable of being fanned into bonfires and which are destined to cool and die. They innately take something and run with it, imagining all of the myriad possibilities and implications. Their brain is wired to work that way. However, this kind of “right-brained” thinking does not come easily to everyone. There are a few techniques, though, that anyone can practice, and if converted into habits, are the first step towards thinking big and becoming a great leader. First, summarize. Create a “tweetable” headline that captures the core idea – the part that made you say “Hmmmmm…” Make it short enough that someone gets the idea in 140 characters or less. Really try to whittle it down to the fewest words possible without losing the essence. Then, generalize. Step through the words in the headline and insert, delete, or replace each salient word or phrase with related concepts, especially if they are broader than, reciprocal to, or parallel to the original. The annual ACM International Collegiate Programming Contest develops teamwork, skills, and algorithmic mastery. The ongoing Dept. of Education International Open Academic Olympics develops teamwork, skills, and mastery of a wide range of skills, at all stages of life. As with any brainstorming exercise, it’s important to not throw away ideas that seem too big, too hard, or are otherwise unsuitable too quickly. Take note of them, come back to them later, and pick the one or two that really resonate. For each such question, mentally tick off all of the implications, both positive and negative, of living in a world where AFTER is true. Don’t worry about how to make that world a reality yet. Here you’re trying to suss out the benefits and drawbacks of the idea. This is a prerequisite for determining whether you may even want to pursue the idea. It doesn’t have to be a full-on analysis – you can always do that later on. These techniques work best if you have internalized them and do them automatically, but they won’t come naturally to you at first. To help you do that, let me propose a 30 day challenge. For each of the four weeks in the challenge, pick one of the four modalities mentioned above (written material, conversations, media like TV/movies/radio/music/art, and technologies), and focus on that modality for the week. Each day, write down the results of the three steps (summarize, generalize, hypothesize) for at least one idea. This is a brainstorming exercise, so try not to self-edit. At the end of four weeks you should have at least 28 ideas – spend the last couple of days polishing them and getting ready for the next steps, which I’ll talk about in a follow-up post: Synthesize, Prioritize, Evangelize. * This second technique has its roots in a meetup I helped found. It was originally suggested by a co-founder Jesse Bridgewater, with inspiration from the TED talk tryouts. It’s a great way to have interesting conversations – ask each person that comes to your social gathering to bring one “What if…” – you’ll probably find you won’t even get to them all!